Departing from the downtown harbor of the historic whaling port of Lahaina, Maui Princess is the largest and most stable vessel to make its’ home here in Maui’s waters. This is a true dinner cruise … including full table service for drinks, salad course, entree, and dessert served at your table by attentive staff in classy waiter attire. Dinner is served on the open air upper deck with panoramic views of the West Maui Mountains and the islands of Lanai and Molokai. 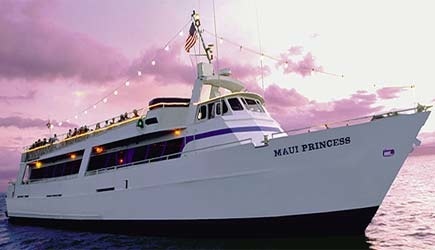 The Pride of Maui’s Sunset Cruise and Cocktail party is a great way to see Maui’s majestic coastline. The entrees include baby back ribs hot off the grill, Hawaiian chicken breast, Maui onion tartlets, grilled vegetables, imported cheeses, marinated artichoke dip, Kula strawberry shortcake and more. Bartenders at the premium open bar will craft everything from martinis to margaritas. And enjoy the sounds of Maui boy Mitch Kepa, whose repertoire includes a mix of Hawaiian, classic rock and dance music. This is an excellent value for a sunset cruise! There is no better way to end your Maui day! Teralani Sailing Charters offers two different daily sunset cruise experiences from Kaanapali Beach. Both Teralani 2 and Teralani 3 are beautiful 65′ sailing catamarans. Both boats depart from Kaanapali Beach; guests take off their shoes and walk through the sand. You will likely get your feet wet…and maybe your ankles and occasionally your knees.. when you board the vessel. Enjoy the panoramic views as you sail the trade winds between Maui, Molokai and Lanai. Complete your vacation with a Maui sunset! This sunset sail departs from Lahaina Harbor. With the golden sunset as your background, enjoy appetizers and drinks! On Paragon Lahaina Sunset Sail combine the adventure of performance sailing and the beauty of a golden Hawaiian sunset. This tour offers hot & cold hors d’oeuvres and beverages, including beer, wine, champagne & Mai Tais. NCL cruise ship passengers in Kahului are able to do some of these Maui Sunset Cruises but an hour drive is required. Lahaina cruise ship passengers are able to do these cruises as long as your ship is in port on one of the days that the cruise operates. NCL cruise ship passengers in Kahului are not able to do the Maui Princess dinner cruise because it does not operate on Sunday evenings. Lahaina cruise ship passengers can do this dinner cruise as long as your ship operates tenders until at least 9pm. No transportation is required as this ship leaves from the same harbor where your cruise ship tender arrives. A short cab ride of about 10 minutes is required. Cruise ship passengers are unable to do the Paragon Sunset Sail. The most popular and longest-running sunset cruise is the Maui Princess dinner cruise. My wife and I recently took two friends of ours out on this vessel … it had been a while since we had evaluated this cruise. We purposely ordered three different entrees and are pleased to report that all around the food was a winner! The prime rib is sliced on board, and the cut was generous and of high quality. The mahi mahi and chicken entrees were equally tasty and highly recommended. We didn’t try the vegetarian entree, but the fact that they HAVE a vegetarian entree is a good sign! It is obvious that this tour operator is really trying hard to provide a quality product. Also a nice new feature … the Maui Princess is able to board passengers at the main loading dock of Lahaina Harbor; gone are the days when you had to ride a shuttle boat out to board offshore! Tables on this boat seat four; during busy summer season there is a good chance that if there are just two of you, it is possible you’ll share a table with another couple. Might be a good chance to make new friends. It’s also nice to have someone to whom you can hand your camera for a photo. The Pride of Maui has now upgraded their cocktail cruise to include entrees. It is a large. stable and very spacious boat for enjoying dinner out on the water. There’s lots of room to roam around and offers a little more privacy if you want to get off by yourself. We’ve always said that this was a good choice for people staying in South Maui who wanted to get out on the water at sunset. Well, we’ve now changed our mind. The Pride of Maui sunset grill cruise is so good it we don’t just recommend it to South Side clients; it is even worth the drive from Lahaina and Kaanapali too! The only down side is that you don’t sit at a table on the Pride of Maui. This is a large, stable vessel with lots of places to sit to enjoy dinner, but you will be holding your plate during dinner. There are plenty of places to sit down, but not at a table, so you’ll be holding your plate while you eat. But from our experience the food is pretty good, and this boat has a less crowded feel than some of the boats where everyone sits at a table. 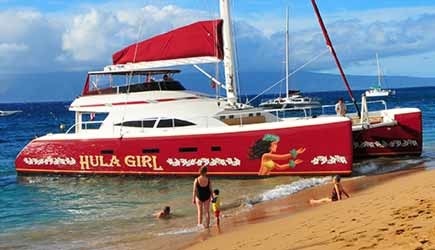 For guests staying at Kaanapali we recommend one of the beautiful sailing catamarans that leaves right from the beach. Teralani Sailing offers two different boats … one with a full dinner cruise and one with appetizers. And then there is the Hula Girl … it’s hard to imagine a more stunning vessel on which to hold a dinner cruise. Everything about this boat is first class, and they are the only one that actually has a fully-functioning kitchen on board. This cruise is different though, as the price you pay to go out on the boat just admits you on board. You still have to order your food and beverages off a menu. The price of their food and beverages is reasonable though, so if you aren’t real “cost conscious” and more concerned about a spectacular experience, then this is a great way to go.